New Fungal Laser for Toenail Fungus can help you be proud of your nails again! Foot Healthcare is a leader in Foot and Ankle innovations. We are no stranger to helping people resolve any foot or ankle problem, including helping patients with the best ways to get rid of Toenail fungal infections. We work with our patients to provide a toenail fungus treatment just right for them! We are proud to present the newest technology in Cold laser therapy with the Lunula Laser to help patients get rid of unwanted fungal infections that can cause ugly and misformed toenails. Along with a treatment plan of the laser and medication, Foot Healthcare can help you stop hiding your feet! Along with the Lunula toenail fungal laser, we also recommend products available through our office to help in the fight against these stubborn fungal infections. 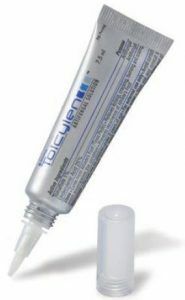 We highly recommend, along with practicing good foot hygiene, the application of topical solutions such as Tolcylen to optimize your toenail fungus treatment. Tolcylen is a wonder-solution that outperforms every other product we have seen available. The solution contains 1% Tolnaftate, 25% Undecylenic Acid, Urea, Lactic Acid and Propylene Glycol. Along with other proprietary ingredients like Jojoba Oil and vitamin E, Tolcylen is different from many other topical solutions for the toenail fungal infections. The combination therapy allowed in the Tolcylen solution eliminates the need to buy multiple products! An easy applicator makes dispensing medication under and around the edges of the nail effortless. The alcohol-based formula eliminates the need for seed oils that require artificial preservatives. or eliminate darkened areas of nails. two weeks for most patients.